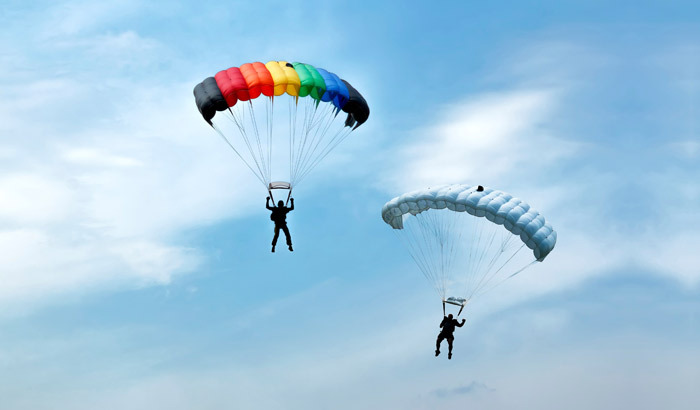 Paragliding is a sport resembling hang gliding, in which a person jumps from an aircraft or high place wearing a wide, rectangular, steerable parachute using a specially designed parachute shaped like flexible wings. It is the recreational and competitive adventure sport of flying paragliders: lightweight, free-flying, foot-launched glider aircraft with no rigid primary structure. The pilot sits in a harness suspended below a fabric wing comprising a large number of interconnected baffled cells. Wing shape is maintained by the suspension lines, the pressure of air entering vents in the front of the wing, and the aerodynamic forces of the air flowing over the outside. Despite not using an engine, paragliders flight can last many hours and cover many hundreds of kilometers, though flights of one to two hours and covering some tens of kilometers are more the norm. By skillful exploitation of sources of lift, the pilot may gain height, often climbing to altitudes of a few thousand meters. A lighter-than-air craft in which air heated by a flame is trapped in a large fabric bag. It is a large balloon that is filled with heated air and that floats in the sky with a basket underneath for people to ride in. The heated air inside the envelope makes it buoyant since it has a lower density than the colder air outside the envelope. As with all aircraft, hot air balloons cannot fly beyond the atmosphere. Unlike gas balloons, the envelope does not have to be sealed at the bottom, since the air near the bottom of the envelope is at the same pressure as the surrounding air. In modern sport balloons the envelope is generally made from nylon fabric and the inlet of the balloon (closest to the burner flame) is made from a fire resistant material such as Nomex. Modern balloons have been made in all kinds of shapes, such as rocket ships and the shapes of various commercial products, though the traditional shape is used for most non-commercial, and many commercial, applications. We are planning to expand our Hot air balloon activities throughout the Schools, Colleges and tourist spots in Kerala. we are providing our activities throughout the tourist destinations,Schools,Colleges and other institutions in South India.